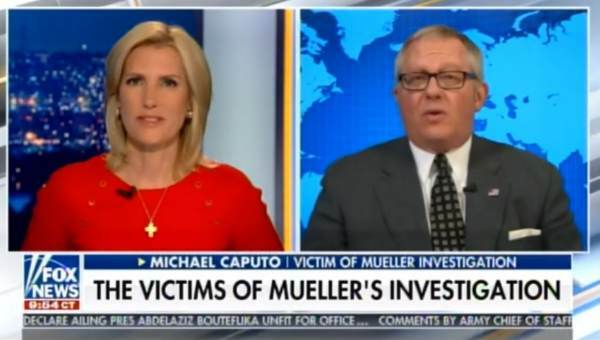 Former Trump campaign adviser Michael Caputo joined Laura Ingraham on Tuesday following the release of the Mueller Report on Sunday. Michael Caputo told Laura his family received their 58th threat online this past weekend after Mueller exonerated President Trump in his two year long witch hunt. Michael Caputo: I spent the day today at my local police department reporting what is about the 58th threat of violence and death against my family. This came in on Sunday night at 9:02 PM on Facebook. It’s not just how much money we spent or what jobs we lost, the homes we lost the revenue opportunities we lost, the tuition payments for our children. It’s not just that, none of us are safe. You know, I talked to a criminal psychologist who I’ve worked with who helped me in this two year period… He told me that now is when we have to be careful because the most unhinged of the resistance now don’t have a report to look forward to. Now they’re going to get really crazy. And some of them are going to go on the attack.